Jaisamand Lake (Asia’s Second Largest Man Made Lake). The lake was built in 1597 By Late His Highness Maharana Jai Singh of Mewar. 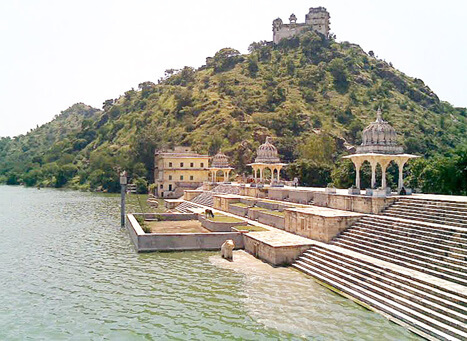 Jaisamand Lake is Located at a distance of 48 kms from the city of Udaipur, Jaisamand Lake is also known as Dhebar. In 1685, Maharana Jai Singh built this lake while making a dam on the Gomti River. This lake covers an area of 36sq km, stretches to the length of 14 km and width of 9 km. The lake is deep to the maximum of 102 feet and has a circumference of 30 miles. Jaisamand Lake is close to the sanctuary that serves habitat to various types of birds, panthers, leopards, deer, wild boars and crocodiles. Once, these woods used to form the hunting ground of the erstwhile rulers of Mewar. In 1957, Jaisamand Sanctuary was built to cover an area of 62sqkm. This sanctuary hails a large variety of resident and migratory birds and animals. In the present date, it has been converted into a game sanctuary.